Sea Pearl was built in 1915 in Netherlands, and first was named Dirk. Lately, this boat was rebuilt and became a member of Silhouette Cruises Fleet. Now this sailing boat has all you might need during a safari. SV Sea Pearl has comfortable social zones. Meals are served in a salon. Here passengers also will find cozy couches to relax comfortably in between dives. Salon equipped with TV and DVD. To enjoy a gorgeous thing that Seychelles has you can use sundeck area of SV Sea Pearl Liveaboard. Magic views of this fascinating country are all here for you. Plus, those, who don’t like much sun, can stay on shaded back deck. 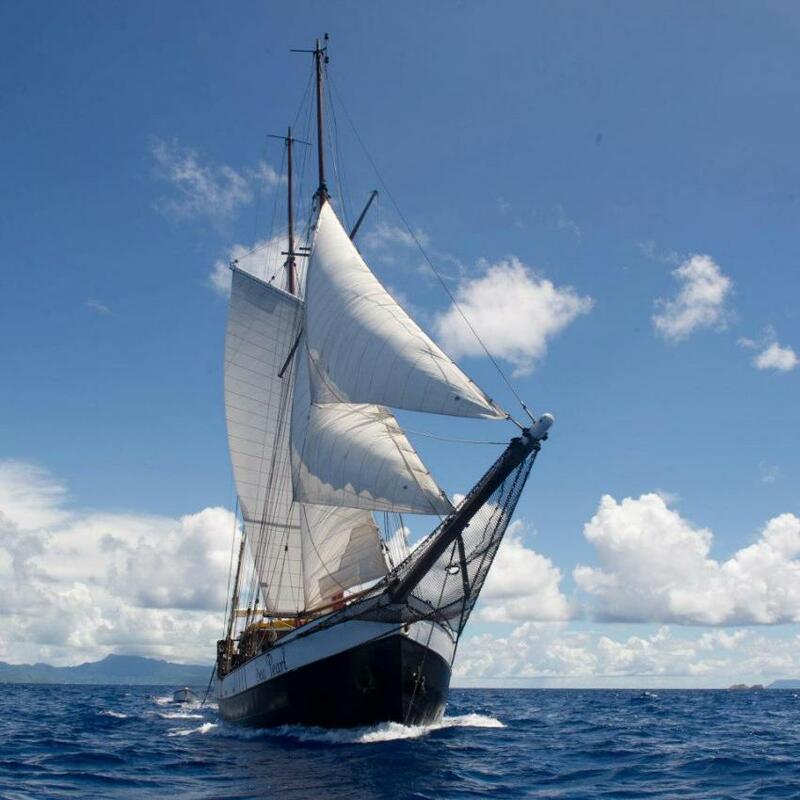 SV Sea Pearl Liveaboard can welcome on board 16 vacationers. All cabins are air-conditioned. There are double bunk style rooms and triples. Safety for SV Sea Pearl Liveaboard crew is the highest priority. The boat has everything to ensure it. Fleets members care about you during the diving. Safari on SV Sea Pearl is made for romantics. The Wind in the sails and a gorgeous view of Seychelles, all this you will get on her board. This boat was made to enjoy traveling. Blue water, inhabited islands are included in your trip. You will get an opportunity to soak the sun and magic atmosphere of Seychelles. Safari on SV Sea Pearl Liveaboard made not only for divers, although they will find many interesting things to discover in the underwater world of Seychelles. But if you are not a diver yet or just want to relax in another way, you can boat can offers you also kayaking or snorkeling in crystal waters. Don’t forget to try fishing on board. During the safari on SV Sea Pearl Liveaboards, you will get an opportunity ti visit several Islands. One of the main destinations in Seychelles is La Digue. Here divers can explore breathtaking granitic slopes, experience the thrill of diving among a school of reef sharks and discover an abundant marine life that includes many species of reef fish swimming among healthy colorful coral formations. Non-diving passengers can visit Anse Source d'Argent. This beach can be decided as one of the most photographed in the world. SV Sea Pearl itineraries include visiting of Baie Ternay Marine Park. That would be attractive for all boats guests, because of a possibility of snorkeling here. One of the stops of SV Sea Pearl safari is Mahe. This famous destination attracts divers with its colorful reefs and variety of different fish, like snapper, jacks and Napoleon's. Plus several types of sharks, for example, stingrays, eagle sharks, nurse sharks, white tip reef sharks, and whale sharks can be often meet here. Most of the divers like it’s dive spots for mild currents and good visibility. The tropical climate of Seychelles makes safari possible all year round. The best conditions for diving are during the calm periods which are April through May and October through November.